So now that it's time to name an All-Pelicans 20th Anniversary Team, it only makes sense that 20-year veteran scoreboard operator Ray Wurm help compile the list. Along with Pelicans broadcaster Scott Kornberg, who has called the latest wave of Chicago Cubs prospects, and myself, who have followed the franchise since its inception, we took a stroll down memory lane and a trip around the horn to pick the best Pelicans of all-time by position. From the inaugural 1999 Carolina League co-championship team to current prospect Aramis Ademan, who was seven months old at the time of the franchise's first game, the Pelicans have made a big impact at the big-league level. Four former Pelicans were named to this year's Major League Baseball All-Star Game – Atlanta Braves first baseman Freddie Freeman (2009), Boston Red Sox pitcher Craig Kimbrel (2008-09), New York Yankees first baseman Gleyber Torres (2015-16) and Chicago Cubs catcher Wilson Contreras (2017), who did a brief rehab stint in Myrtle Beach. 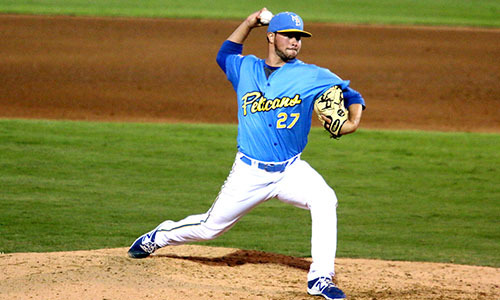 * Pitchers: Pelicans fans have gotten to see some of the biggest names in pitching make rehab starts, including Hall of Famer Tom Glavine (2008), Steve Avery (2000) and Tim Hudson (2009), but there have been several young guns come through Myrtle Beach en route to the bigs. Our starting rotation is Kimbrel, Kyle Hendricks (2012), Julio Teheran (2010), Adam Wainwright (2002) and Jason Marquis (1999), who made the franchise's first start. (Honorary spot in the bullpen for “Eastbound & Down” fireballer Kenny Powers (2011), portrayed by actor Danny McBride for the mythical Myrtle Beach Mermen while shooting season three at TicketReturn.com Stadium. * Catcher: Hands down, this one goes to 14-year MLB veteran Brian McCann (2004), who spent nine seasons with the Braves, played in seven All-Star Games and was named the MVP of the 2010 Midsummer Classic. Currently, with the Houston Astros, the six-time Silver Slugger is looking to win another World Series ring before hanging up his mitt. * First Base: Adam LaRoche (2001-02) did a two-year stint in Myrtle Beach while coaches tinkered with his funky but effective swing. They finally gave up and let him swing away – all the way to a successful 12-year, 255-home run major league career. Growing up around the game with his big-league father, LaRoche became a national favorite when he bypassed millions to retire early after his son was no longer welcome in the clubhouse. (Freeman might well steal this spot by the 25th anniversary team). * Second Base: The Pelicans have had some studs at second, including underdog turned seven-year pro Marcus Giles (1999) and current Texas Ranger Rougned Odor (2013). But Torres has been burning it up in his rookie campaign with the Yankees, batting .294 with 15 homers and 42 RBIs before going on the DL just before his All-Star debut. Torres has the talent to be one of the brightest stars in the big leagues. * Managers: The Pelicans have hit the jackpot on skippers throughout the years, led by inaugural manager and current Braves boss Brian Snitker (1999-2001), who is in his 42nd season with the organization. “The staff is phenomenal,” Kornberg said. “Myrtle Beach has always had great leadership.” Local favorite and Murrells Inlet resident Rocket Wheeler (2006-11), longtime pitching coach Bruce Dal Canton, and current Pelicans manager and 2,000-plus game winner Buddy Bailey (2016-present) round out a talented staff that has helped numerous players make the climb from Myrtle Beach to the major leagues. After a day at the ballfield, take the family back to Bay View Resort for a nice relaxing night at the beach.